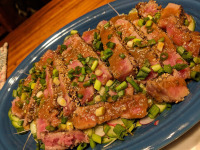 Delicious, cooked rare, tuna over a bed of cucumbers and radishes. 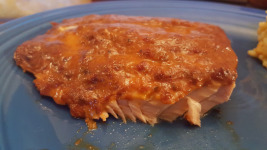 A spicy and sour take on baked salmon. 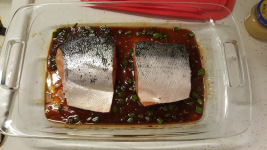 Broiled salmon seasoned with a sweet garlic glaze. 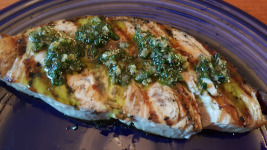 A grilled swordfish recipe with a chimichurri-like (but not chimichurri) topping. 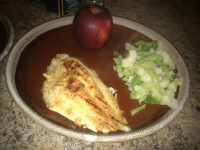 A simple dish made from just a few ingredients you likely already have. 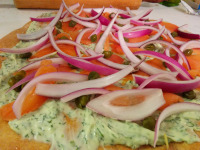 A simple pesto topped on salmon cooked any way you like. A unique pizza, to say the least. 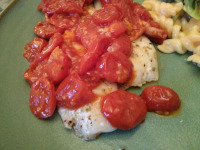 A simple flounder dish, with basil and tomatoes. 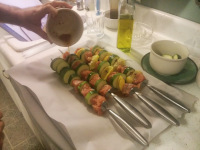 A fairly simple kebab recipe with a wonderful cucumber dipping sauce on the side. 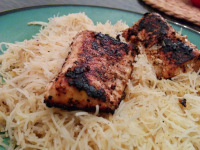 A unique salmon dish, a breeze to make on a busy weekday. 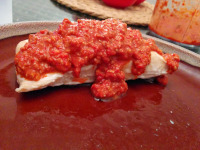 Simple and unique fish taco recipe. 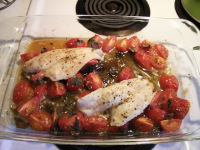 A simple flounder dish with a wealth of flavor. Catfish marinated in a honey mustard sauce, delicious. © 2018, Phillipsoft LLC. All rights reserved.